When considering World War 1, look beyond the horrific statistics, the battle grounds, the rows of crosses and the war memorials that dot every town and suburb in Australia. Each soldier was a human being with hopes and ambitions. They were larrikins, lovers, husbands, fathers and sons…. 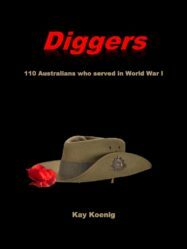 Diggers is a book about 110, randomly selected, ordinary Australians who served in the Australian Imperial Force during World War I. It aims to give these men and women faces. Who were they? What was their family background? How did they serve during World War 1 and most importantly, how did they live their lives after the war ended? Were they successful, happy…? The one hundred and eight ordinary men and two women, feature in Diggers. They fought in Gallipoli, the Middle East and on the Western Front. The youngest was seventeen and the oldest forty-five. They were soldiers, sappers, signalers and stretcher bearers. They served in the infantry, light horse, artillery, medical corps, the service corps, the air corps, the payroll and postal corps. They were heroes and cowards, privates and officers. Some died, some were wounded, and nearly all were ill at some time during World War I. Many of their parents and grandparents were Australian pioneers, others were newly arrived immigrants. All had interesting stories to tell about Australia’s early years, the war and life in Australia during the first half of the 20th Century. Kay Koenig was born and raised in Broken Hill, NSW. She graduated from Macquarie University in 1978 with a BA in geology and Australian history. She spent twenty years working at the Geological and Mining Museum in Sydney. From 1976, she was in charge of the exhibition department. In addition to the mainstream display, the department was responsible for a yearly special exhibition program. This involved a good deal of research and writing. Whilst at the Museum she wrote two short books, Broken Hill- 100 Years of Mining, 1983, to accompany the Centenary of the Broken Hill exhibition, and Mining in Australia, 1988, the highlights of mining in Australia from aboriginal quarrying to the 1988. In 1990 her third child was born with a disability. Both Kay and her husband, Chris chose to change their careers so that they could care for their son. For the next ten years they operated a garden centre on the Northern beaches of Sydney. After selling the business in 2002, Kay began her writing journey. Her first book, Voice From His Suitcase, was published in 2012.